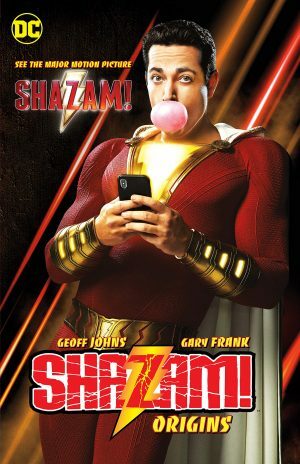 So many Shazam! 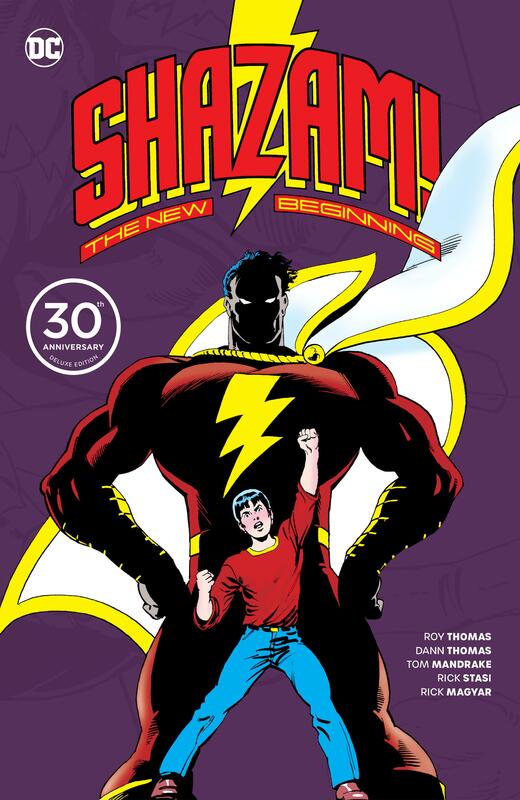 graphic novels feature the assorted re-bootings the character has endured over the years, and this was the 1987 relaunch with Roy Thomas the prime motivator. For this 30th anniversary edition he provides a somewhat bitter editorial, not explaining much about the conceptual background, but providing considerable detail about the lack of a subsequent regular series. Thomas does lay out his lifelong love for Captain Marvel, and the reasons he felt the whimsical hero of earlier times needed to be updated into a character able to mix more readily with other DC superheroes. 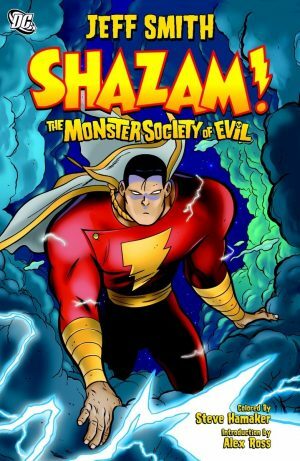 He and co-writer Dann Thomas start, though, by establishing how Billy Batson is orphaned and introducing a twist never considered in any subsequent revisions, that of Billy being related to Dr Thaddeus Sivana and going to live with him and his narcissistic children Beautia and Magnificus. Others would build on the incorporation of Black Adam into the revised origin. Thomas and Thomas also make the most of the good-hearted misfit Uncle Dudley, including a great scene of his magic act going spectacularly right for once, as he becomes an advisor to the new Captain Marvel. Also good is how Billy Batson isn’t the immediately confident superhero of later incarnations, but still an uncertain thirteen year old, a distinction that comes across well in the writing. According to Thomas’ editorial, then new artist Tom Mandrake may not have been keen to accept the assignment. If so, that doesn’t show in his art. At it’s best it has the friendly charm that’s always been integral to Captain Marvel, and the pages that aren’t as good can be ascribed to a talented artist starting out. He creates a marvellously sinister Dr Sivana, and it’s a shame we never saw more of his Mr Mind, whose cameo introduction is inventive. 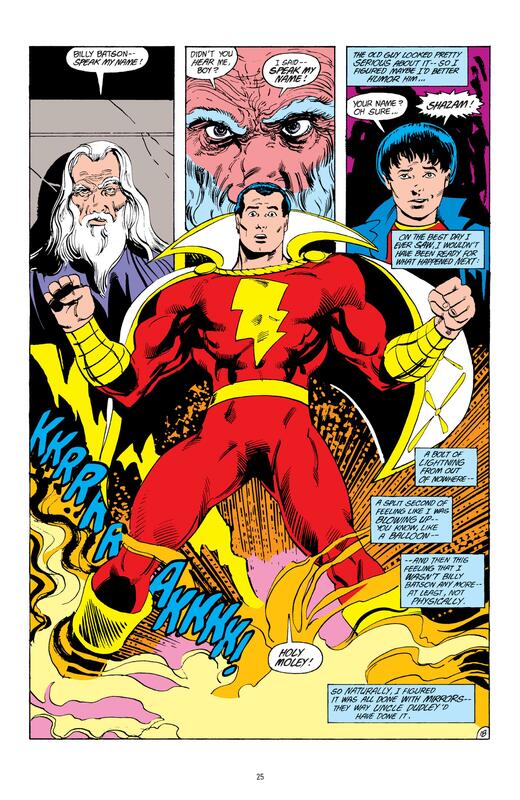 The writers made a success of what they set out to do in 1987, but time has passed, and much of A New Beginning is now ordinary when set against present day superhero stories and later Shazam! re-boots. Anyone who enjoyed it at the time, though, may still have a nostalgic glow. Not as impressive is the melodramatic follow-up. Rick Stasi doesn’t have Mandrake’s eye for a dynamic page, and the well meaning ridicule of Billy infiltrating a neo-Nazi summer camp now reads as positively bizarre. It’s a set-up to introduce a new Captain Nazi, but odd, very odd, to see an opening panel of someone wearing a Hitler European Tour 1939-1945 t-shirt on a DC splash page. Times have changed.